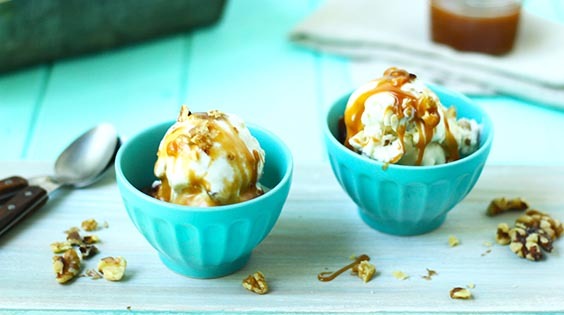 Toasted walnuts and salted caramel make for a fancy and mouth-watering treat. Easy to make at home with family and friends. Line baking sheet with parchment paper, spread walnuts out in even layer. Place in oven to toast for approximately 8 minutes, or just until fragrant. Remove from oven and coat with melted butter. Set aside to cool. Combine cream and sweetened condensed milk in mixing bowl and whip on high speed until soft peaks form. Add buttermilk and vanilla; mix on low until well combined. Pour mixture into a metal loaf pan, cover tightly with plastic wrap and place in freezer for one hour. Remove the pan; gently fold in half of the walnuts, recover and place back in freezer for another hour. Repeat same process with remaining walnuts. Cover tightly again and place in freezer for at least 6 hours or overnight. Serve with salt caramel sauce. In a medium heavy-bottomed saucepan, combine the sugar and water over low heat until the sugar dissolves. Increase heat to medium and bring to a slow boil; do not stir at this stage. If necessary, use a wet pastry brush to wash down any crystals on the side of the pan. Boil until the syrup is a deep amber color, about 8-10 minutes. Once it starts to change colors, watch closely. It will go from light to dark quickly and will easily scorch. Remove the sugar from the heat and carefully whisk in the heavy cream and butter. The mixture will bubble. Stir in salt, then transfer the sauce to a glass jar to cool. Caramel will keep for up to two weeks in tightly closed container inside refrigerator. It can be warmed up in microwave to serve. The sauce also works great for dipping fruit or drizzling on top of pound cake.